This week’s arts pick highlights society’s obsession with mobility and the resulting eradication of privacy and traditional boundaries. To portray the potential devastating consequences of our absurd fixation with mobile devices, the artist uses both location and well-chosen, commonplace materials. First, consider the location. The piece is installed at the end of a long, dark passage, which serves as a metaphor for the most dangerous part of our collective subconscious. The idea of an open-air, itinerant toilet may seem far-fetched, but many of today’s most insidious and nefarious objects originated in the same dark recess that is represented by this alley. Next, observe the materials chosen by the artist. The subject is a juxtaposition of two items whose invention changed the course of humankind. The toilet signifies the bodily functions that enslave a society striving for complete control and automation of its environment. The toilet is our prison. Wheels, however, connote freedom and mobility and a desire to escape the confinement of our inconvenient bodies. Escape, however, does not come without a price. The artist deliberately omits the traditional “stall,” warning us that our control and mobility mania will ultimately erode the remaining boundaries of decency, which are crucial for preserving a semblance of humanity. This arts pick is currently located in the Old City neighborhood of Philadelphia. However, due to the piece’s transportable nature, its venue is subject to change without notice. I especially liked the addition of the plastic cup. It is there to remind us that we can never escape from this prison. 1. Is there any connection with collars up/down and toilet seat up/down? 2. Perhaps this is a nostalgia piece to remind us of dive bars and frat houses. The empty cup most assuredly had beer in it that has now been recycled into the bowl, and what about that plastic thing in the shape of a condom? 3. And if itâ€™s freedom you are seeking, why not go for complete and private (?) freedom with the Stadium Gal /Pal? Are you sure that isn’t just someone’s trash? Because if it really is “art” then I have a basement full of it. I could have my own exhibit. I think the point is that we should not seek this kind of freedom. 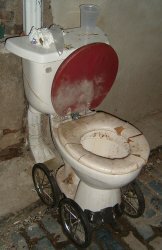 Clair, the addition of wheels to the bottom of this toilet is a sure sign of art, not trash. Perhaps you could make a case for found art. Obviously, though, the stuff in your basement cannot be found art as long as it stays in your basement. Wow! All that information from a porcelain potty chair. What imagination!! What ingenuity!! What….. WTF? we all have a basement full of art. I believe that was a clear message in the original piece. we must search the bowels of our beings to find it. Theresa, I think you have a future as an art critic! (spoken with clipped British dialect): If I were the artist of this piece, I should have entitled it “Porta-john”.